The Making of a Wobble Frog... Trailer? One of the reasons I love posting frequently about games as I make them (I mostly do this on twitter), is not just because of the encouragement I get from seeing people interested in what I'm working on. It's also because of the great feedback I get from people, positive or otherwise. An extreme example of this is the story of how I came up with my brilliant marketing plan for Wobble Frog, specially the game's trailers. I had posted the first video of the updated Frog character design, and got a response from Brian implying the character would make for a cool/interesting working physical toy. That planted a seed in my mind that slowly took roots over the next few months. I eventually decided that I should make one. A working Wobble Frog "toy"! Mostly, I just thought it would be a really fun project. Of course it would take time and money to create, so I gave myself the ever-so-flimsy justification that "I could use the toy to make an interesting and original trailer for the game!" and started the project. 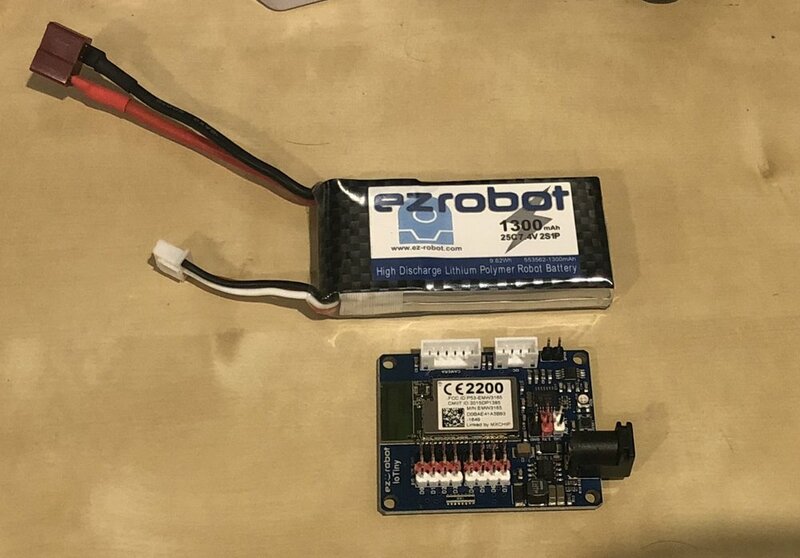 My basic plan was to get a robot-building kit that would provide the basis for the electronics, and I found just what I needed in the EZ-Robot system, in particular the EZ-B IoTiny and the LiPo Robot Battery 7.4v so the toy could be completely wireless. Next I had to find some servos with enough travel to handle the wide range of motion of the Frog's "jaw" and "waist", which in the game is ~250 degrees. Most servos apparently max out at around 180 degrees. After much searching I found some "270 degree" servos and ordered them. Print out the design on paper, spray-glue that to foam core, and build it like a very thick paper craft model. This idea worked great! First I used a 3D modeling program to create a simplified 3D model of the frog, to the real world scale, based on measurements of the servos, battery, and logic board, to make sure they would all fit. I used a great Windows program called "Pepakura Designer" to take that 3D textured model and "unfold it" into a layout I could print and re-assemble into the 3D model. I first tested the model with regular white paper to make sure it was going to work, and test the size and scale of the model. It's a good thing I did to, as it made me realize several errors in the sizing of things, particularly around the servo mounts. Next I printed out the textured version at a copy shop, sprayed it onto foam core, and got to constructing the shell. It took quite a while, but was actually really fun to see the pieces come together as a physical object. Finally I had to mount the servos and fit all the electronics inside, and voila! A working Wobble Frog. The EZ-Robot system is really cool in that it has a simple interface for designing customs controls for your robot, which you can deploy to your mobile phone and use that as a controller. So when I want to use the frog, I turn it on, join my iPhone to the robot's own Wi-Fi network, and then connect through the app. My little control system consists of 2 sliders, just like the controls in the game, which control the physical servos on the toy. It can't quite move as quickly and strongly as the toy in the game, but overall I'm really happy with how it turned out! Here we see Wobble, who is apparently a "Let's Play" personality, playing a game apparently based on him/herself! This was really fun to make, and try to match the editing style of Let's Play personalities, whilst still communicating the basics of the game, and keeping the length of the trailer as short as possible. This one really plays up a fictional conceit that Wobble Frog was an actual popular toy from the early 90's, that's being revived with a new mobile game. I liked the conceit for the popular 'list video' format, and the variety of ways to play up the physical toy as well.